To date, the wormhole drive is regrettably the best known method for traveling large distances. The technology being utilized today was actually salvaged from a Praelor starship. At the time, scientists didn't know the full potential of the small mechanical device. 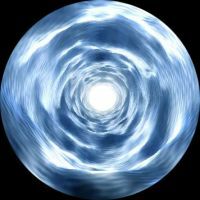 After several years of research, the device, which scientists dubbed the subwarp drive, allowed objects to be transported small distances through the use of artifically created wormholes. The technology was eventually adapted to allow starships to travel small distances within sectors in a fraction of the time it would take a conventional relativity drive. The full potential of the find was not realized until Camilla Nakahashi joined the research project. Thanks to her designs and discoveries, it became possible to create larger, more stable wormholes through the aid of navigational beacons placed near the destination. Unfortunately, the technology discovered on the Praelor ship could only go so far. At the present, wormhole technology is still relatively new and limited. The further you wish to go, the larger the drive and power requirements go. It is hopeful that we can overcome this limitation but it seems that, without a more advanced Praelor drive to study, we won't be near the level of technology required to produce smaller, more energy efficient wormhole drives.